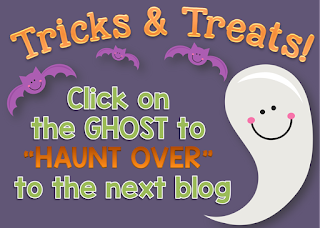 Teaching FSL: Tricks & Treats: A Halloween Blog Hop and Giveaway! Tricks & Treats: A Halloween Blog Hop and Giveaway! Hi there! Thanks for stopping by this Sunday morning. Today's blog post is part of a Halloween Blog Hop with several other fabulous Canadian teacher-bloggers. Many thanks to Erin Beattie who is hosting this holiday-themed blog hop. Be sure to check out her awesome blog at some point during this event, and at any other time as she always is working hard at sharing something with her readers. If your students celebrate Halloween and your school has no policy against participating in this holiday (which has always been secular to my mind, but I know some people would deeply disagree!) then my tip for you in the French or other second language classroom would be to use this opportunity to encourage students to practice and perfect certain expressions that will be useful to them in a number of situation (i.e. guy with pickaxe in his head is HOPEFULLY a description your students WON'T need to use with any kid of regularity in French!). So get them talking about something they are excited to talk about anyway, their costumes and plans, their favorite media related to this holiday, the best costume they ever saw... and don't treat celebrating Halloween as a major French cultural undertaking because there are few places where francophones really celebrate Halloween in the way we do in North America. To this end, I made a fun activity for students to use to express their preferences and opinions. 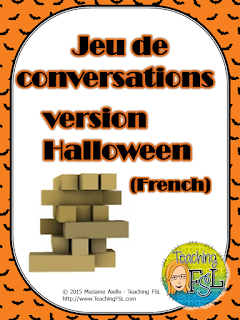 It's a Halloween conversation game based on the wooden tower building block game called Jenga. Get students talking about what they want to talk about anyway, but in French.The questions require students to read (possibly using resources available in the room to confirm meaning and acquire or reinforce vocabulary), speaking (to answer the questions before placing the block they've pulled out of the tower to place it on top) and listening (to pay attention to their partner or group members' answers and decide if a point is awarded) as well as possibly the opportunity to respond to add their own reaction to classmates' answers. This activity is free to download in my TPT store for a limited time only! Grab it this week if you think you may use it. And please, I remind you that things people share with you for free are still their intellectual property so please feel free to share a LINK to this activity with another teacher if you loved it, and not to actually distribute the file itself, electronically or otherwise. See the image that follows for the "secret word" that you're collecting from this web site. You'll need this for the Rafflecopter entry further down in this post. We're giving away 4 gift cards to TeachersPayTeachers. Awesome, right? Be sure to enter. ... and please continue to "haunt on" by clicking the image below the Rafflecopter widget to go to the NEXT education blog in the list! If you're looking for more Halloween activites in French, I also have this spooky Halloween recipe idea in my store. It's an oldie but is still popular and a great way to practice talking and writing about quantities, body parts and using the impératif (or infinitives if you prefer, as is typically more common in recipes). Haha! I had to laugh when I got to your mention of the guy with the pickaxe in his head! :) Thanks for the freebie! The pickaxe was a nice touch! What a very thoughtful post. It occurred to me that you teaching French, therefore communication skills; and myself in Special Education, where part of my job is teaching a Social Communication program to students with Autism, these roles have more crossover than I had ever given thought to previously. Your freebie (translated into English) would be a great activity for my Social Group! In essence, we're both teaching the language of social conversation to those who are not as strong in that area. Excellent post!